Plans are well on the way for the looming trip abroad, although I must confess it feels more like a state of chaos. Robin is in high practice mode, preparing for the concerts he will be giving whilst away. He has also been purchasing numerous sets of strings, and downloading music, podcasts and the unabridged version of 'Hard Times' read by Martin Jarvis. That should all keep him busy. Actually, I would imagine that it will be quite reassuring to sit in his room, miles from home, and be able to watch 'Newsnight'. I, on the other hand, am dealing with more practical issues like printing out travel itinerary, gathering passport etc. and generally packing. So please forgive me if I'm somewhat brief this evening. I read a few interesting points made by A.C.Douglas over on Sounds and Fury about the pianists whose recordings were used on the Hatto CDs and their apparent inability to recognise their own work. There may be other factors in play. A lot of musicians don't actually like listening to their own recordings after the last take has been made. 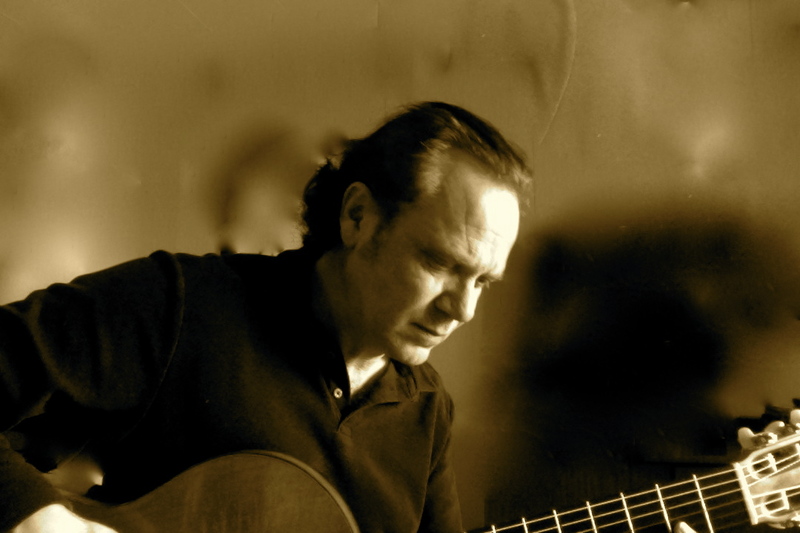 In an interview, Paco de Lucia once said, that he 'never listens to his music after recording it as he would always hear things he would like to change'. If that is the case for the pianists, then they may well not have identified the Hatto 'version' as their own, as they certainly wouldn't have been expecting to hear themselves. To highlight the point, Robin was once staying at his parents' house, enjoying a relaxing bath whilst they had the radio on in another room. In the distance he heard 'Canarios' by Gasper Sanz and thought, 'That sounds great'. Next came J.S.Bach's 'Gavotte' from the 4th Lute Suite followed by 'Bach Prelude in D Minor'. All of which he enjoyed and decided he really must work on those pieces if he was to attain the standard of performance of whoever had made this particular recording. He had previously recorded an album for the BBC library which was regularly played on Radio 3 and 4. At the time he didn't have a copy, so hadn't heard it since it had been recorded some years earlier. It's always an honour when an author contacts you to ask a few questions and establish your opinion. Last week Dr.Kevin Dawe, a senior lecturer at Leeds University, School of Music, asked to meet up with Robin. As he was over at the university today, putting a few students through their paces, they arranged to get together. They spent a happy hour talking about all things connected with the guitar. Dr.Dawe's book, 'The World in Our Hands: The Guitar in Music, Culture, and Society', looks like it will be an excellent read. Robin was able to shed a little light on things from a performers point of view, and left a copy of his own book, 'The Guitar Gymnasium', for Dr.Dawe to read. I told you it was a fantastic instrument. To mark the end of half term we had a family outing to a science museum for children. We got to press lots of buttons, carry out various experiments, talk to robots and generally have a good time. Oh, son number one and two also enjoyed it. But whilst you can take the musician out of the music room, you can't take the music out of the man. Robin managed to find the one thing he could play. Plastic pipes full of various amounts of water that you hit with two small bats. Yes, he did get a tune out of it. I, like most people involved in the world of classical music, continue to follow the Joyce Hatto saga. Today in 'The Daily Telegraph' there was a small piece about her husband William Barrington-Coupe and how he has previously been convicted, and jailed, for tax evasion. This was way back in 1966 and whilst I don't feel we should let 'old' crimes cloud our judgement, inevitably it forms opinions. Whatever the outcome of this particular case there are bound to be repercussions. Record companies are already looking into the claims that their works were pirated. As I said before, we know all about that. Two tracks, that have been widely distributed, composed and performed by Hill/Wiltschinsky but credited to another artist, are still available. The company has acknowledged their mistake but not actually done anything about it. Artists themselves are often way down the list in the pecking order which is preposterous. Maybe this whole affair will give the industry the shake up it needs. They would after all be nothing without the performers. As you will be aware Robin is off on his travels again soon. Anyone going abroad has to keep up with their immunisations and that includes Robin. Unfortunately for him, he required a few booster doses, and had those last week. I can't believe it is 10 years since we both had that one. It was for a Hill/Wiltschinsky tour in a number of countries, including Venezuela, hence the need for the jab. It was worth it though, I had a great time taking in the sites of Caracas whilst Robin and Peter rehearsed in their rooms! So off he went to the travel centre and was issued with a long list of horrendous side effects, which doesn't exactly put you at your ease, before the vaccine was given. Still, at least it's done for another 10 years, and we have the certificate to prove it. Robin has decided the ones we were testing yesterday are not quite right, so they are being returned. He explained the problem to a very helpful chap and they are now sending three more to see what we think of those. It's very tempting to just get on with recording, but his guitar has such a beautiful sound it's criminal not to do it justice. It has been an experimental day and one in which I have been acting as an unofficial sound engineer. We have been sent a matched pair of microphones to try out. So, off Robin went to the studio, to see what he could do. He played Caprice No 33 by Luigi Legnani over a few times, and then went for a take, and another one, and another one, etc. (Incidentally, Legnani was Paganini's guitarist). We played them back and as yet haven't made a decision. At one point I asked him to play along with the freshly made recording so I could compare sounds. As I was listening it struck me that if Robin was having difficulty matching his playing exactly, whilst watching the sound waves on the monitor, then it would be virtually impossible for someone else to try and mimic that performance. Yes I am referring to the Joyce Hatto scenario. The fate of the microphones hasn't yet been decided, although I suspect they are not the ones. Our thoughts have turned to travel as Robin is preparing to go away late next week. The main concern these days is the safety of the guitar. For the past 30 years he has always taken it into the cabin when flying as it fits nicely into the overhead locker. However, all that changed with the new rules. If you remember we had a huge panic here, locating a second flight case that goes around his original case, suspending it on foam. This was all done over 48 hours, the new case being flown specially from the USA, to arrive in time for a foreign trip. It did arrive, and has proved itself many times now, but that doesn't make it any less worrying. Especially as one of his concert guitars is already away being re-fretted. I was rather concerned when Robin came up with a new and controversial plan. It came about whilst looking at the front page of The Daily Telegraph that featured the 'burkha bomber'... fleeing the scene of the crime under Islamic dress. Yes, you guessed. He thinks it might just work, he could carry the guitar under the burkha and no one would be any the wiser. Alternatively, he would be quite happy for the airport authorities to x-ray the guitar, as they always used to, and take it on board. It's hardly a dangerous weapon, well, not in his hands anyway. Last night Robin was booked to play at a private function. That is not unusual, but, the day before he found out that it was for musicians. As you can imagine this made him rather anxious as went on his way. I spent the evening planning my de-briefing session for his return, and unusually, he didn't call me in the interval, so I didn't know whether to take that as a good sign or not. Finally I heard from him. Not only were they musicians, but they were in fact all classical musicians from a variety of orchestras, The Halle and Liverpool Philharmonic to name just two. I held my breath as I waited to hear how it had gone. Playing to room of very discerning customers could have been a nightmare. They all thoroughly enjoyed it and at various points in the evening came over to express their enthusiasm. Robin enjoyed it too, as he got to talk to a room full of like minded people, some of which he knew, and some that he recognised from various performances he has made. So the de-briefing was off and we had a cup of tea instead. Having met Ramsbottom the cat the other day I thought it was time I introduced you to one of our two Labradors. So here she is, Bimps. As I've said before, she is actually called Coco, but we always call her Bimps. This is because Mozart had an English Terrier called 'Miss Bimperl', shortened to 'Bimps', which when translated means 'Spot'. Mozart must have had a sense of humour to call his dog, 'Spot the dog'. As you will see our Bimps doesn't have a spot in sight as she is chocolate all over, but she is probably the most eccentric dog you will come across, or some might say 'dotty', hence the name 'Bimps'. She's an essential member of Hillhouse as loves long, rambling walks, particularly if very muddy puddles are involved, and therefore it provides Robin with the perfect reason to put his guitar down and take a break. She will in fact sit and stare at him until he does. The other evening we watched 'Soul Britannia at the Barbican' on BBC 4 and were delighted to see Madeline Bell giving a fabulous performance. Madeline and Robin go back a long way, from 1978 - 1989 Robin played many dates with her around the globe including the historic 'Talk of the Town', London, for 6 weeks, the 'Sporting Club' in Monaco, 'Gulf Hotel', Bahrain, Cannes, Muscat, Portugal, and many, many more. Robin always really enjoyed these trips as Madeline is a fantastic professional, always has great musicians with her, and knows how to treat them very well. The last time we saw her was some years ago when we watched her live at 'Ronnie Scott's', Birmingham. It was actually the first time that I'd met her, but she was very hospitable and enjoyed mulling over old times with Robin in the interval. It was great to see her on the BBC again. I took the afternoon off to go to a family function and on my return the whole world is talking about the late Joyce Hatto. To read all the reports you can go just about anywhere, but here are a couple of starting points. Gramophone, and Pristine Classical where you can hear the two recordings played alongside each other. Nowhere on the CD are the duo mentioned. Apart from the moral issue, it's rather upsetting, as this particular recording is released through a major outlet. Robin is feeling rather glum today. He has two concert guitars, both Miguel Rodriguez. As you may have gathered from reading this site Robin does an awful lot of playing. Every care is taken with both the guitars to prevent damage but you can't stop general wear and tear. From time to time any instrument used at this level will require a little TLC. His first guitar has reached that point. The frets have literally worn down and need replacing plus a few minor repairs. The man entrusted with the job is the renowned luthier Paul Fischer, who trained under the late David Rubio, and set up his own studio in 1975. He has had a good look at the guitar and is very impressed by the high quality cedar wood and has now taken on the delicate task of repair. For Robin, this has meant a six hour round trip, the return journey in an empty car. I think he may need some TLC himself this evening. Over the last few days we have had an increase in visits from the USA and also I've noticed a few requests in local US radio stations for 'Corta Jaca' by Radames Gnattali, performed by Hill/Wiltschinsky on their 'Danza' CD recorded by ASV. There is a story attached to this particular recording. Robin had heard a recording of the the Assad Brothers playing this piece and desperately wanted Hill/Wiltschinsky to perform and record it. Unfortunately the music wasn't published. After a great deal of detective work Robin got a contact number for Gnattali (in Rio) himself and gave him a call. They spoke for some time but it was a very frustrating call as he spoke no English and Robin doesn't speak Portuguese. Nothing was therefore resolved. Sadly Gnattali died some time later, no connection to the 'phone call I assure you. So after a great amount of work Robin painstakingly took down the music from a recording. This wasn't easy as it is a difficult piece to play. However, he did it, and Hill/Wiltschinsky went on to record 'Corta Jaca' and 'Schottisch' on Danza and performed them many times, with excellent reviews. The pieces are taken from 'Suite Retratos' which means 'Portraits'. Corta Jaca is a fantastic piece composed in a samba style, which is typically Brazilian, with a beautifully meandering rhythmic theme. The middle section features sparkling virtuoso counterpoint between the two guitars, before the slow lyrical section with chromatic harmonies that heralds the return of the main theme. I've just read Jeremy Denk: Think Denk and was amused to read that a lookalike is required for the late pianist Sviatoslav Richter. Read his entertaining blog for the full story. It did remind me of a case of mistaken identity though. Robin was in a room backstage at The Barbican, London, preparing for a performance that afternoon. Whilst taking a break from his warm up exercises he sat at the piano and played a few notes. He does play piano, but it is generally reserved for personal amusement, composing occasionally, and late night parties here at Hillhouse, certainly not for the paying public. There was a knock at the door and a member of staff entered. "We're ready for your rehearsal Maestro Roge." He knew that Pascal Roge was performing a concerto later that evening, and realised that the unwitting staff member hadn't realised her mistake. For a second I think Robin was tempted to follow her up to the stage, take his place at the piano, and enjoy the occasion. To sit in front of an entire orchestra waiting for you to start performing, not having a clue what you are meant to be playing, is the stuff that musicians nightmares are made of. What I find amusing is that Pascal Roge must have been in a dressing room that had 'Robin Hill' on the door. As it is such a wet day here, and I've had various messages from agents about some forthcoming trips, I thought I'd remind myself why Robin does it. This was taken in the Cayman Islands late last year. You can see 'Crystal Symphony' in the distance. So you see, it's not all bad, touring can be quite pleasant. Domesticity, the Enemy of Art? I'm sure that for a lot of musicians and artists that could well be the case. It's one thing gradually building up a reputation when you are single, and quite another when you have the responsibility of a family. Many disappear as domestic life takes over. However these 'disappeared' would probably not have stayed the course anyway. Very little will distract the dedicated artist from his/her path. So when family comes along sometimes sacrifices have to be made. Frequent trips away from home are never easy, but the up side is that when not travelling, children see far more of their fathers/mothers than those in conventional jobs. A balance has to be reached. In our case domesticity certainly wasn't the enemy of art but the engine! Robin has composed some of his best pieces after significant events on the domestic front. His first concerto, 'Concerto Primavera', was composed after the birth of son number one. Many pieces have been named after various pets that have given us a great deal of pleasure and often the 'spirit' of that pet is shown in the music, 'Molly's Jig' for example is a lively, bounding piece written for our late black Labrador. So after yesterdays blog when son number two was sick, it was no surprise to me that Robin was able to calmly take himself off and immerse himself in his music! Heitor Villa-Lobos's guitar works are probably the most studied guitar compositions of the twentieth century. Despite the cello being his main instrument, he was very attached to the guitar and told Turibio Santos in 1958 that he 'loved the cello but the guitar was in his heart'. In fact the 'sound' of the cello can be heard in many of his guitar compositions. As a youth he enjoyed the company of popular musicians and practiced improvised guitar accompaniments to the choro, music in favour in Rio de Janeiro at that time, perfecting his talent to the detriment of his medical studies. It was in 1924 that he met Segovia in Paris and the two became friends. Segovia encouraged Villa-Lobos to compose more for the guitar and from this came some fantastic music which helped to establish Villa-Lobos as one of Brazil's most respected composers. Robin is re-visiting some of these pieces after a 20 year gap and thoroughly enjoying himself. He's playing 'Choros No 1' composed in 1920, and the 'Cinq Preludes' from 1940. There was reportedly a sixth Prelude which has never been found. So I'm in my element listening to these fabulous pieces as I go about the house. Still, at least I could listen to this beautiful music as I mopped fevered brows and kitchen floor. Well you did ask about the life of a musician. Once again there has been talk about clapping between movements of a concerto and whether musicians and/or audience find this a distraction. I've discussed this before, but will say again, that here in Hillhouse the feeling is that historically audiences applaud if they feel it has been an outstanding performance. Robin finds this reassuring, quietly acknowledges the applause with a smile and a nod, then continues, using this encouragement as a motivating force, and providing an even more exciting performance. There is the story of Sir John Gielgud sitting in the audience and watching a play. Part way through he stood up and said, "Is there a Doctor in the house?" A gentleman rose and replied,"Yes, I'm a Doctor." To which Gielgud answered, "Doctor, isn't this play bloody awful." Now that would be a distraction. If you remember a blog the other day titled 'Arrangements and Not Venice' then you will know that Robin found some new tuners. They have been making steady progress from California and we were informed that they would arrive today. Son number two was posted as lookout which kept him amused most of the morning. With much excitement the Fedex parcel arrived. 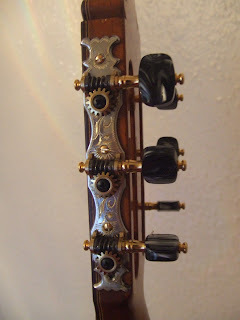 The tuners or, machine heads, were immediately installed and I'm delighted to say that they are not only beautiful but are doing the job very well. Whilst having a look around some of my favourite sites I noticed a strange thing. Many of them have cats and have shown pictures of them in the last few days. That in itself is not odd but all the cats are ginger and stripy! So not to be outdone, here is a 'photo of our cat, 'Ramsbottom'. If it looks like he is being held rather tightly, it's because he is.. I still haven't forgiven him for walking over my laptop the other day and standing on some vitally important key which resulted in all the settings being altered and none of the keys making any sense. Thankfully a friend diagnosed the problem over the telephone and normal service was quickly resumed. Why people with an interest in classical music have ginger cats I'm really not sure. Whilst I have been researching all things feline Robin has quietly been getting on with his practice and working on another programme. He has a return visit to a venue coming up soon, and as it's less than a year since he was there, he feels a new programme is in order. Today I was surprised to find that someone somewhere had found their way to this site from searching 'musicians stage accidents'. I was intrigued, (and would love to know what they were studying!) so did my own Google. I was delighted to find that 'Life of a musician - Accidents Happen: Part 1' was the fourth item. Strangely it didn't mention part 2, but that's computers for you. There it was, amongst various tales of tragic accidents, the 'Dead Musicians Directory' and adverts for life insurance! Meanwhile Robin was out and about in a small, very nice town, not that far from where we live. He was delighted with his find as the stand is able to go quite low down which is an advantage for guitarists. He went in to make his purchase and felt he had been transported back in time. A lady, who didn't appear to actually work there, was walking around cleaning everything with a feather duster, including his freshly purchased stand, as he waited to pay. It seems that the world of music is not alone with the intrusion of modern technology. I read an interesting article by Ruth Graham, 'Surreptitious Snapshots', in the New York Sun. 'phones and even reproduced to hang on the wall at home. I can't quite understand why people cannot see that this is not allowed for a reason. Artists, like musicians, labour long and hard over their work and for every 'home made' copy which hangs on your wall an artist has forfeited his or her royalty, in much the same way as 'home made' recordings or videos of a concert deny the musicians their income. The sound quality would certainly not have been of a high enough standard to allow public release. To me it's just taking the arts for granted, people must realise that to be a performer or artist one must be completely dedicated to that role. It reminded me of a Hill/Wiltschinsky concert many years ago. They played in a very nice venue and after the concert a distinguished gentleman came backstage and said, "Splendid chaps, splendid. You must came and play for us but, of course, we can't afford to pay you.."
They do occasional charity concerts, but come on, they need to earn a living..
Robin has been over at Leeds University again today. He was asked to go and help during a lecture on the history of the guitar. After the success of last week's concert he thought it safe to return. The lecture was open to all the non-music students, and was well attended. One of the lecturers gave a talk and Robin punctuated it with pieces of music from the relevant period. He started with a couple of Renaissance Lute pieces, moved onto Baroque with a 'Bach Prelude', Classical period with 'Mozart Variations', 'Recuerdos de la Alhambra' - Tarrega for Romantic, and for the 20th century, Villa Lobos 'Choros No 1' and 'Xodo da Baiana' - Dilermando Reis. For a sample of Spanish music and to demonstrate the flamenco style Robin played 'Rumores de la Caleta' - Albeniz. Throughout the whole event Robin talked about the various pieces and techniques he uses and also the guitar he was playing. Today he played his Miguel Rodriguez Churchdoor which is a beautiful instrument, literally made from a churchdoor, with spectacular Brazilian rosewood. I love Sunday mornings. Mainly because it is the one day of the week when we don't (usually) have to rush around. Also, it's preceded by, more often than not, a late night. Yesterday was no exception, Robin didn't get home until well after midnight. We then sat and chatted for a while, consequently another late night. So this morning it was a delight to see clear blue skies, sun streaming through the windows, and Beethoven Violin Concerto in D playing whilst we had our morning coffee. Both fabulous performances, the first by Itzhak Perlman, the second by Heifetz. We debated it long and hard but eventually decided that the Heifetz recording just had the edge over Perlman. The playing on both was fantastic, it was just the interpretation that won us over. But it's so subjective I could easily vote the other way given a different mood or frame of mind. That's the beauty of music. Regular readers will be aware that the guitarists nightmare is a broken nail. For years Robin has struggled with many different techniques to overcome breaks/chips/general wear and tear. I've scoured many shops in far flung places trying to track down ping pong balls, (in the early days), silk strips and super glue, not easy if you happen to be in Borneo at the time. More recently specialised silk and glue has become available and although it does the job is time consuming to apply and therefore not ideal for an emergency repair. Well, we may have found a solution. I won't name the product until it has been tried and tested, but so far it has withstood some serious rasguedos. Another benefit is that they can be cut to shape in advance which would be ideal for urgent repairs in the concert setting. So we are all keeping our fingers crossed, except for Robin, who is out playing and even he can't play in that position. So watch this space and I'll keep you informed of developments. After the recent post about Force Ten a mini reunion is underway. We have stayed in touch with some of the band over the years, but thanks to Paul Griffin have now made contact with Tony Williams. He was the singer in the band and later went on to join Jethro Tull on their 'Bursting Out' tour. Robin actually spoke to Tony and discovered that he has been heavily involved in elephant conservation, so that explained one picture. As yet we haven't established why Paul and his wife Irene were also with elephants but it made a lovely picture. Not to be outdone Robin raided son number ones bedroom and found a large elephant teddy, promptly took a photo of himself with it and mailed it on to the relevant parties. So far New York has replied, suitably amused. Today Robin has been working on some new arrangements. It is an essential part of any musicians life to constantly plan ahead and gradually introduce new pieces to a programme. We once worked out that Robin could play for about 5 hours without repeating a piece and that was just his solo repertoire! But it is all about balance and selecting the pieces for a programme with care to give maximum enjoyment to the audience. Consequently Robin is always on the lookout for new pieces, often arranged from other instruments such as the piano, or his own compositions, to keep things fresh. At one point this afternoon, whilst taking a break, he was surfing the internet. There was a shriek of delight followed by, 'You must come and see this, it's beautiful'. I dropped what I was doing, with thoughts of a short break in Venice, I'd just got to the part where we were sipping coffee on the banks of the Grand Canal having just left the Piazzo San Marco, when I arrived at the music room. Robin was beaming, 'Aren't they fantastic? ', well, yes, they were nice, but they were also tuners. You know, the bit on the head of the guitar used for - tuning.